Is Trump planning to break the internet? Re: Is Trump planning to break the internet? This is one we can't can't really blame on Trump. This is the Republican members of Congress and Senate, who have been trying to destroy net neutrality for several years now. Well that is going to be like trying to punch smoke. Especially for the political idiots. From Trump's and the Republican's point of view they are not breaking the web, they are fixing it. They see it as having a serious problem, it isn't making as much money for rich people as it could. Removing net neutrality would address that problem. They don't understand that the narrow minded "most cash" outcome is not the best outcome. Well Donald Trump thinks it's OK to hand over classified materials to Russia so the internet is fair game. In any country with a less corrupt government he would be on trial for high treason. Are the American people all asleep? I think we can do it. Let's save the Internet one more time. We just need to use the power of the Internet to massively protest agaisnt this prejudice. Share the word with your peers. Make yourself heard online and offline. Rally up with your friends and discuss about it while we still can. It is our collective duty as Internet citizens to defend our freedom of speech. We cannot accept this delegation of the Internet to the elites. The Internet can be a fully democratic tool to resist agaisnt tyranny and oppression. We must not let this hijack happen! Freedom is too important to let the elites control and regulate the Internet. This battle is not yet over, its just the beginning. If you have ever examined the exchanges on social media you would realise that no one cares who runs the internet as long as they can sling mud at each other. Not a cohesive movement. More like a bowel movement. Not true. The Internet is much more than social media. The Internet is what empowers thousands of diverse communities around the world to share knowledge independently. The force of the Internet is based on net neutrality. We need to preserve that at all costs! Social media is just a bunch of socialist websites driven by major corporations to automate surveillance and monitoring of our behaviors online. I don't participate into theses websites because they're not friendly towards free speech and net neutrality. In fact, I encourage people to use social media only if they don't care about their privacy. This Tuesday (12/12/2017) is the time to rally up and stop the FCC from killing net neutrality! I urge you to massively join us in this epic battle for the future of the Internet. 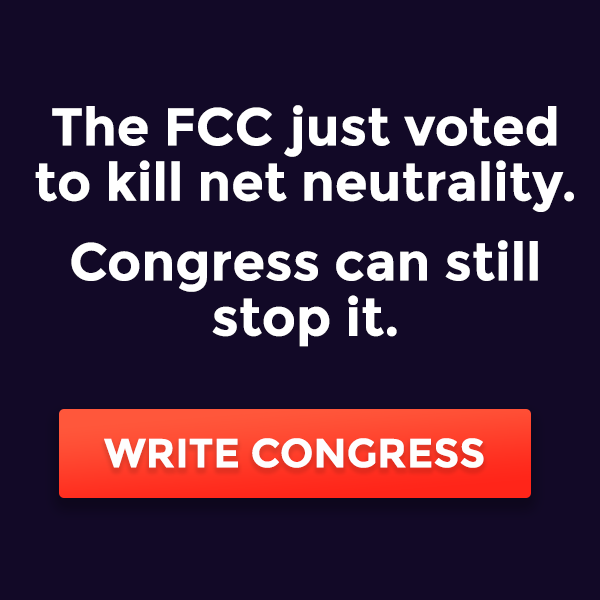 Please visit https://www.battleforthenet.com/ and https://www.fightforthefuture.org/ for details on how to participate and stop the FCC from ruining the Internet. In line with Trump's policy of reducing regulatory red tape, the FCC is making a decision not to regulate the internet. This would not have a big impact in areas with competition in internet providers, but many areas of the USA (especially rural areas) have only a single internet provider. It will be interesting to see what these operators dare to do with their monopoly power. For the larger operators, alarm bells will be ringing if they try to do things in monopoly areas that they don't do in competitive areas. I think it will be the high bandwidth services like Youtube and Netflix that are most likely to attract charges from the telecommunications carriers, which may force them to put up their prices. Against this, Youtube and Netflix may threaten to withdraw support for high-cost networks. No carrier wants to have a network without Youtube and Netflix! It's called the World-Wide Web because it stretches far beyond the USA. My country has never had an explicit Net Neutrality rule, and it (sort of) works. There is still oversight by the competition watchdog and the communications department, who jump on excesses. Net neutrality is not based on free market forces. Rather it is based on government manipulation for campaign contributions. Picture if the government came up with a law requiring food neutrality.This means all food objects have to the same price. A loaf of bread has to be the same price as a lobster. While a Maine lobster in a restaurant in Maine, has to be the same price as a Maine lobster bought in a Phoenix Arizona restaurant. This looks good on the surface, if you are a socialist. However, it leads to a rigged system; spawn of the swamp. If the Maine restaurant has to charge Arizona prices for lobster, there is a huge profit windfall, since lobster is plentiful and cheap in Maine. The price would be lower in a free market, but can't, due to the law. This is how you can get a campaign contribution skim. If Arizona has to charge Maine prices, with the higher overhead in Arizona; extra shipping costs, Arizona goes out of business. It is not neutral to business or to the local consumer. It is one of those alluring naming scams; like the affordable care act, which is not what it is sold to be, by its name. When you get rid of food neutrality, free market forces appear where pricing becomes based on the laws of supply and demand. This stabilizes the local markets. Maine will be cheaper for lobster; $4.99/pound, while people in Arizona get used to $20/pound and eat beef instead. If profits are too high, competition will become attracted to those areas, to help drives prices down. Also 5-star restaurants get to charge more than fast food for a fish plate, while fast food can't change $19.99 for the fish sandwich. If we lose this battle, the Internet will never be the same again. We need net neutrality to ensure that small businesses and communities have equal access to the world wide web. Please rally up and protest massively to tell the FCC to not allow the elites to rule the Internet. Net neutrality is not based on free market forces. A free market does not require more transparency, it requires fair-trade and equal opportunities for all. A free market means, we all play by the same rules, which are based on the laws of supply and demand. In a free market, the consumer gets to decide what to buy, based on the results of free market forces. This does not guarantee equal results for all merchants, since not everyone is as competent or as creative. More business will fail instead of succeed, with the consumer better off. In a free market, a business cannot just decide it wants to start a new business, that makes a knockoff version of an iPad, and expect to make billions; rigged system. You need to compete, with many other factors deciding the final outcome. it is not decided by a law. If we use an extrapolation of net neutrality, and call it iPad knockoff neutrality, then the government can force the market to give you a share, all based on greasing politicians with campaign contributions.The consumer gets ripped off, due to the law forcing an inferior product onto the market, that would not rise to the top, in a free market. The Politicians don;t care after they get greased. Iff anything the disfunction is useful for future skim. When internet providers are required to price fix, no matter the quality of service, there is no incentive to evolve the products, since any future cost savings will not be rewarded by the market. Instead, you will better off replacing your R&D staff with lobbyists, who will pay politicians, so you can raise prices, by law, on second rate products. This is how the net neutrality skim works. Free market R&D, to improve products; hire scientists, as a way to increase profits, is replaced by back door deals with politicians by hiring lawyers and con artists. This is a swamp thing. Trump is draining the swamp. The top five riches counties in the USA surround Washington DC, due to such laws and the need to hire lobbyists to get one's share of the skim in rigged system. In the liberal mind, net neutrality is similar to forcing companies to hire leftist decided minorities and women, based on a quota system, instead of on merit. It is not free system, but a rigged system. They have been brain washed to believe the Republicans are better at business; evil business party. This means the free market must be the rigged system that needs to be made fair by cheating. Based on leftist programming, this world view implies that leftist can't compete in a free market, with the Republicans, but need to rig the system to make it fair. They need the golf handicap.That is all brain washing, because many of the richest people and largest companies are run by leftist. Look at Bill Gates. The leftist can compete if they want to. There is no need to cheat, if you look at the data and question your brain washing. Could you please explain to @puppypower why it is a prejudice against the world to kill net neutrality? But in a genuine free market it could. However, most markets around the world including uk and us are highly regulated, particularly in the areas of competition, intellectual property and protecting local suppliers. A very sad day for Internet freedom. Do woodpeckers ever break their beaks whilst pecking on trees? What is the scientific break through in fighting Malaria in news Today? Page created in 0.25 seconds with 83 queries.